Last Friday three men at the heart of my passion for the intellectual investigation of food systems spoke at Cooper Union about Nature as Measure. In the forward to the eponymously titled book, Wendell Berry quotes longtime friend and the book’s author Wes Jackson saying, “Do not try to improve on this patch of native prairie for it will serve as your standard by which to judge your agricultural practices. There is no higher standard…” In other words, no human intervention can create a more perfect natural world because nature is perfection. Just as one man quoted from the other in print, so too did the two men share glimpses of their intimate relationship on stage by completing their responses to Mark Bittman’s prompts with quotes from each other’s long histories of writings. Wes Jackson is a scientist but he expressed some resistance to the way researchers and programmers try to understand everything from the smallest units of meaning. He said, “when you break a problem down to the point where there is no ambiguity, you lose its relevance.” In other words, to view something at the atomic level marginalizes its context, making it easier for you to comprehend but preventing you from maintaining sight of the original challenge. This tartine does not require cooking or spices, but it is bursting with flavor from the fresh radish. This recipe is elegant in its outward simplicity, but its mode of production from seeds, land, farmers, transportation and markets to final processing in my kitchen is incredibly complex. It’s perfect for a quick and easy appetizer any time of day or alongside a protein-rich soup for lunch. And it gives hope for spring’s new harvest and the picnics at which we enjoy the longer days of sun. 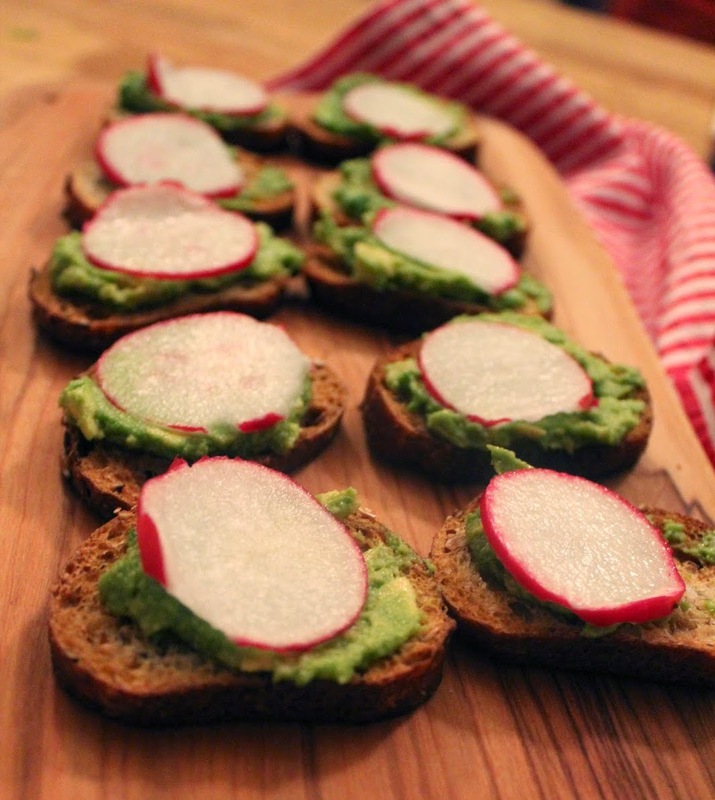 Radish and butter, plus the buttery avocado, is a legendary flavor combination. Slice bread into 1/4″ thick slices and toast until golden brown. Rub each piece with butter. Thinly slice radish with a knife or mandoline and submerge in a bowl of ice water to crisp. Mash avocado with a pinch of salt. 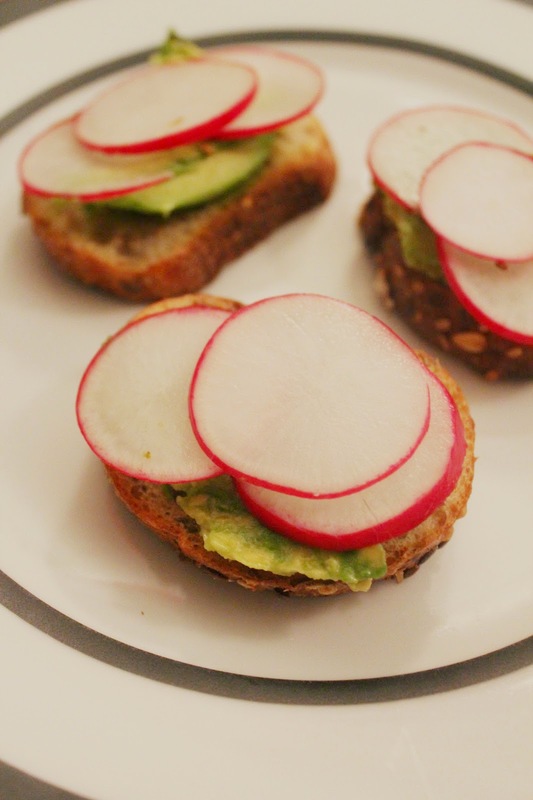 Spread a spoonful of avocado onto each piece of toast and top with a few slices of radish. I used a 6″ multi-grain sub roll to make appetizers for just a few people. Buy in a small portion like this so it doesn’t get stale. …or enjoy a not-sad desk lunch!